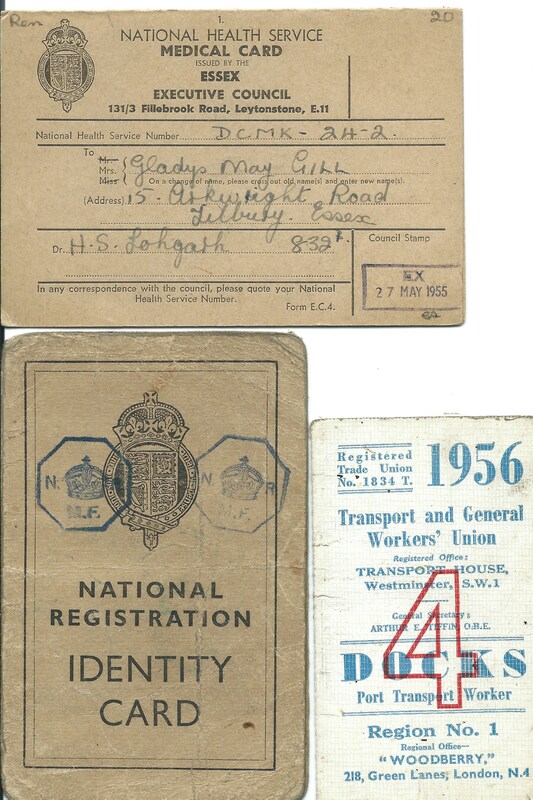 Documents retained: my identity card from start of war; a medical card with Dr Lohgarh and a transport and general workers union card belonging to my a dad when he worked in the docks dated 1956. Audrey you are correct in this and I remember them well. Bill as you well know worked for Ormonde’s in Calcutta Road and then for himself at the Broadway . I remember their son Colin being at Palmers when I was there but he came via Lansdowne Road School whereas I went from Manorway. Hello William I think my Dad’s sister lived next door to the Beadles at 32 Spencer Walk they were Bill and Vi Wright. Hello Audrey I remember you dad around Tilbury and like you have a supply of these union cards left behind with my late fathers belongings. These were very important because without union membership you could not work. I remember 1962 seeking employment with Green & Silley Weir and the foreman was only interested in my union membership not if I had been properly trained and been to college.